The antithesis of strength is weakness, or so says common ideology. But weakness is, more often than not, a counterpoint to strength — a part of strength’s unique individual make up, not an opposition or wholly separate thing as the phrasing might suggest. In strength there is sometimes weakness, and in weakness there is often strength. This is a core truth of life that is not taught in school. There is no doubt that everyone on this planet has a weakness, whether it masquerades as strength or reveals itself in vulnerability. It is a universal truth that no person is without that thing that weakens them to the influence of others or the villainy of self-destruction. The crux of "AKA Crush Syndrome" is weakness, or a perceived lack thereof, of almost every character. 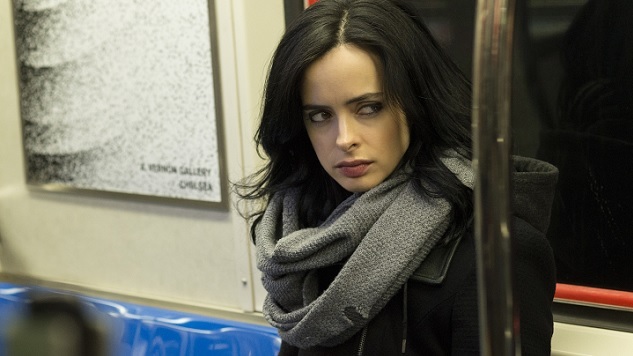 Jessica Jones’ weakness seems obvious on the surface — Kilgrave is the monster she fears the most. He is the source of her continued forward motion in the episode. After the horrendous murders of Hope’s parents, Jessica sets out to bring Kilgrave in, clear Hope’s name, and, in the process, discover exactly how far the extent of the bus accident has weakened him. Her mission is to find a way to defeat him, not only for Hope’s sake but also her own. She seeks justice through the only way she knows how: her detective prowess and knowledge. The thing about weaknesses is that they are never as simple as they seem. For every Kilgrave, there is a Trish — willing to mother, poke and prod, and show Jessica her unending love. Jessica fears something happening to Trish perhaps even more than she fears Kilgrave repossessing her. Kilgrave took from her sanity and the right to her body. Trish provides her a link to love and the good that Jessica has in her heart, no matter how hidden it may be behind the snark and the occasionally incidental half-strangulation. Jessica believes Trish to be vulnerable to Kilgrave. She doesn’t see her as able to hold her own against such a man and this is the reason for their estrangement. Jessica doesn’t want to be held responsible for something happening to her best friend but Trish is secretly training in Krav Maga, determined and intensely focused never to be the damsel in distress of the weakness for any person outside of herself. She is not the picture Jessica has painted her as. She is a strength in potenia, waiting for the moment Jessica needs her most (#LadiesSupportingLadies). She is the lioness rather than the cub people think her to be, but it is uncertain in this episode if her willingness to throw herself into the fray is for good or ill. She is strength and weakness rolled into one fierce package that can only be defined as human. Luke is feeling the repercussions of Jessica’s incriminating photographs. He slept with a married woman and the husband, in a bout of awesome dude-bro mentality that never gets old, decides he’s going to get a bunch of buddies together and beat the crap out of Luke. Jessica rushes to his rescue, feeling responsible for the photographs that were handed to the police without her permission — and perhaps feeling an inkling of like for the man she so recently slept with. At his bar, Luke reveals himself to be untowardly strong. He takes a broken bottle to the neck and shrugs it off with a sigh. This fight is also the best thing to ever happen to fights. Luke’s totally bored expression is a thing of legend and I wish to give all the high fives in the world to Mike Colter for playing it so well. In the end scene of the episode, Luke reveals that he is like Jessica — different, stronger, potentially Inhuman, but that does not mean he is unbreakable. The things that break him will not be physical. His breaking happens on the inside, and they have already happened to him. His damage is real but unseen, much like Jessica’s. Even Hogarth is revealed to have a weakness for beautiful secretaries and having Jessica Jones owe her a favor. The focus of the episode is, of course, the play of Jessica’s unnatural strength, her ties to Kilgrave, and her self-imposed loneliness against the decision to hunt down Kilgrave and take him out on her terms. The three themes play against each other nearly continuously. Jessica is physically strong but personally isolated. She wears her defensiveness like body armor, but her heart aches to let someone in and be the girl she was before Kilgrave came into her life. She wants to push everyone out on the surface, but she rushes to Luke’s aid without hesitation and makes the first step toward rekindling her girl-mance with Trish despite her misgivings. She is fighting to find a balance — desperate for something to change, but, along the way, she becomes the change she is so determined to find. Around the themes of strengths and weaknesses, the plot is etched into unraveling the past — or at least the very last day Jessica saw Kilgrave. A bus rolled on top of him, as buses tend to do, supposedly killing him. That was the beginning of horror for a poor paramedic, whose kidneys were stolen from him to save Kilgrave. Jessica tracks him down and encounters the man, who has suffered a stroke, presumably from Kilgrave, and his religious mother, who sees Jessica as the devil and a godsend in nearly the same breath. The scene with the man is beautifully tragic. It is shot with careful attention paid to emphasizing the man’s entrapment in his own head and Jessica’s dawning horror as she realizes that he is in hell and there is nothing she can do to stop his suffering. She is either too strong or too weak to end his life, though he wants nothing more. Though it is not explicitly stated, it is clear that Kilgrave visits him in flashbacks as much as he does Jessica, only Jessica has the means to redirect her thoughts and her body. The man is what she could become should her looming confrontation with Kilgrave fail. Jessica’s next stop is the doctor who performed the surgery on the paramedic — a doctor who saved Kilgrave from certain death. After a bit of a chase, she manages to convince him to tell her what he knows in the darkness of a college basement. Interestingly, the truth is found often in the dark in this series, a constant that adds to the realism and tone of the show. Jessica is focused on Kilgrave’s potential injuries, his weaknesses, anything that can bring him down and offer her a solution to his powers. Her fear and trauma have turned him into the boogeyman and she is desperate for some sign that he is human enough to defeat. She finally finds what she is looking for in the doctor. He reveals that Kilgrave cannot be sedated without losing his powers. She has his weakness. It is clear she intends on using it. It is also clear that things will not be as easy as she hopes. His weakness may not be the one she truly needs. The most striking scene is the most talked about one from the episode, with good reason. The entrance of Kilgrave in the present suggests a man who is narcissistic, sociopathic, and so typical of this world that he would never stand out from a crowd. He is not hulking or broad; he is not a mutant, nor painted by the colors of the devil. He is you and me, and his entrance is beautifully shot from the start. From the moment the door is thrown back, he radiates. Though he is off camera at first, you feel the power of his evil in his request. When he enters camera, he is shrouded in darkness, still a mystery, still ineffable. As he stands at a glass window, seemingly revealed for all to see, he remains in that half-darkness, the shadow that Jessica very much has a right to fear. His treatment of the family is as scary as it is revealing. On the surface it shows his evil and is indifference to human life. On a deeper level it reveals that Kilgrave has a weakness that Jessica has not yet realized. He sees people as expendable, and can control them with a word or a gesture, but he does not know true love. He demands it, but it is not the sort that settles in the bones and sinew of a person. Jessica inspires it unconsciously, despite her determination to eschew all relationships. Her abilities to draw people in to her circle make her as vulnerable as it does strong. The same goes for Kilgrave but in reverse. He has no one in his corner, and this will inevitably come to haunt him. The entire entrance is also an example of great directing and cinematography. The setup is perfect from start to finish, the controlled, steady shots exactly as they need to be. The result is a scene that’s creepy, sad, and terrifying. Kilgrave is not on camera nearly as much as the family, which puts you in their shoes more than maybe you want to be. His entrance is unforgettable, and it provides so much character detail in a remarkably short amount of time. Jessica Jones’ second episode is all about character — what makes them strong, what makes them tick, what weaknesses are strengths in disguise, and vice versa. Jessica is tasked with facing herself, her past, and her abilities to do real good in New York City. She is blossoming into the hero she is meant to be, and her story remains beautifully feminine, quiet, and perfectly balanced between the shadows of the past and the hope of the future. I have a feeling Kilgrave has no idea how much she has grown and how seriously he needs to take this new Jessica. I also have an idea that he will absolutely find out. We’ve all thought about strangling that one loud neighbor. Jessica keeps it real. Don’t be jealous. I’ve heard of a wizard in a cupboard, but never peeing in a cupboard. That scene was seriously disturbing, and all the props go to the writers for daring to show that abuse happens to all ages. Trish is the nagging mom of the friend group. It’s like she gets me. I totally thought Trish was Kilgrave-controlled and running off to jump in place after her conversation with Jessica. Which was the point. Well done, show. Well done. Twin siblings who act like jealous lovers is the very definition of my nope zone. Luke Cage took his shirt off and sawed himself until he sparked. This is not a sentence I thought I would ever write. Hope was mean to Jessica and all blame-y. It was kind of weird and the only moment that I didn’t track the writing. Can people who have been cheated on stop blaming the person that their spouse cheats on with and blame the freaking spouse? I know it’s realistic, but you married one of those people, not the other. Okay? How long until someone else’s head goes through that new glass pane?